We were beginning to think that the teaser video from last month was just one big hoax, but turns out Google Now for iOS actually exists. And, in typical Google fashion, the update is fantastic—great, wonderful, awesome; we expected nothing less, especially with Google proving it has the design chops with efforts such as Maps and Gmail for iOS. The integration isn't quite as unencumbered as it is on Android, but that's no surprise. 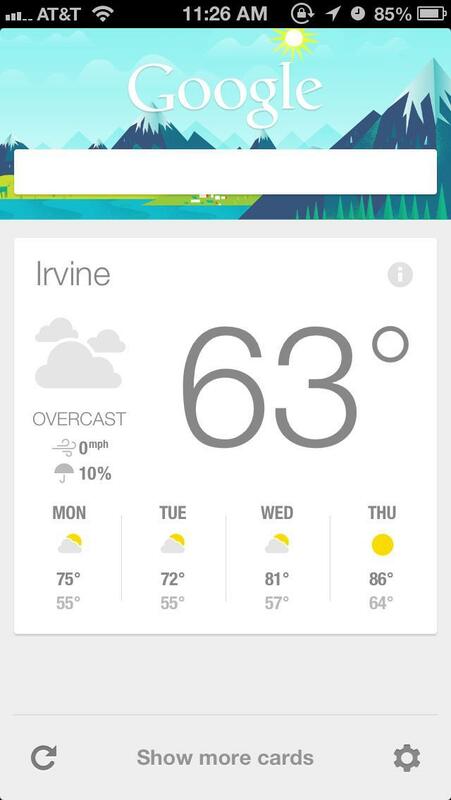 Google Now for iOS is still every bit as useful as it is for Android. The experience on Android—easy swipe-up access and background sync—is still superior. But for those pining for Google's excellent predictive intelligence, iOS users are still getting that core functionality that's made Now such an important Android feature. The look and feel is there, once again showing that Google can design a heck of an app; it just takes a little more effort to access Now for iOS users. Update Google Search for iOS and you'll immediately be introduced to what Now does, followed by a question asking if you want to opt in (yes!). 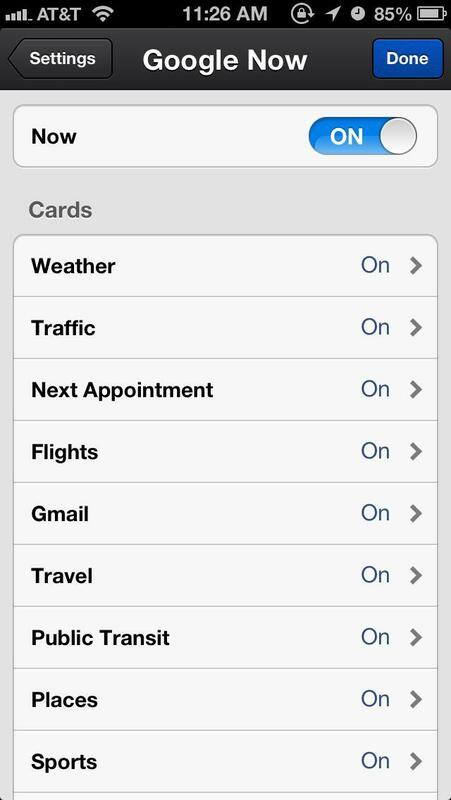 Once you do that, sign in with your Google account and it'll start to populate with cards so it can provide information exactly when you need it. I've been using Now on a Nexus 4 for the past several months, so I already had cards in my feed. Chelsea beat Swansea, and the Lakers fell to the Spurs. Also: it'll take me 21 minutes to get Home, with light traffic on the 405 right now. Clicking on, say, your route home will pop up those directions in the Google Maps app (if you've downloaded it), while clicking on weather will bring up results inside the Search app itself. When you first pop open the Search iOS app, you'll get the familiar search bar with Apps, Voice and Goggles button toward the bottom. Below that is where you'll see a stack of Now cards and clicking on them will bring up the feed, at the end of which you can refresh, show more cards or go into your settings of what cards you actually want to see. 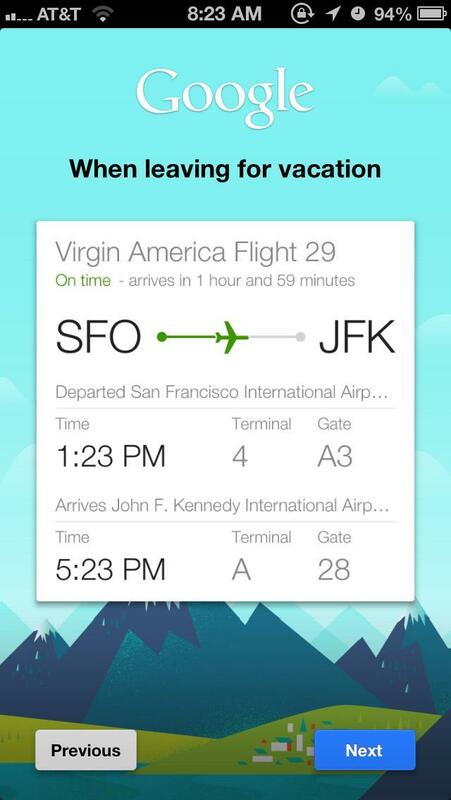 Animations are smooth, and getting back into the Search app is as easy as swiping down. Right now, 22 of the 29 card types are present. Airline boarding passes, Fandango and local events are among those that aren't available. Now also won't push high-priority alerts through iOS' notification system, so it looks like you'll have to jump into the app when you actually want information—that part is a huge bummer. It does, however, use iOS' background location feature, so Now will always know where you are for weather and direction information. With Now reportedly being planned for the desktop, introducing the service to iOS users is a smart move on Google's part. Let people settle in while Google collects information before pushing it out to everyone everywhere. We wish it was integrated more deeply into iOS' skeleton, but sadly that's not the case. 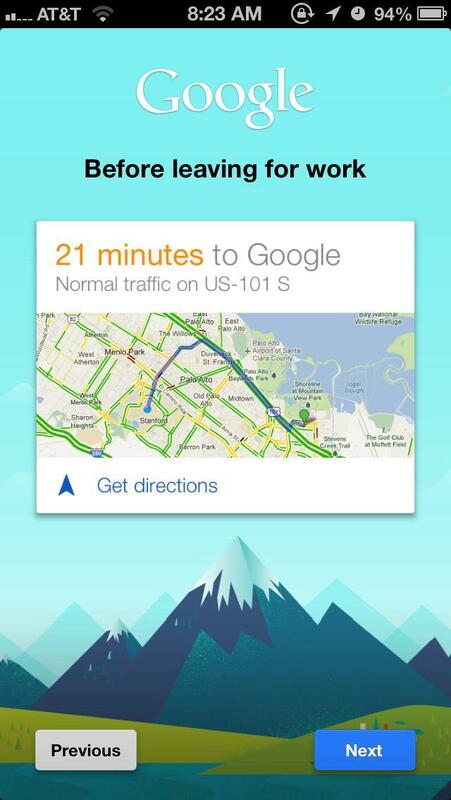 That's one big advantage Android still has. 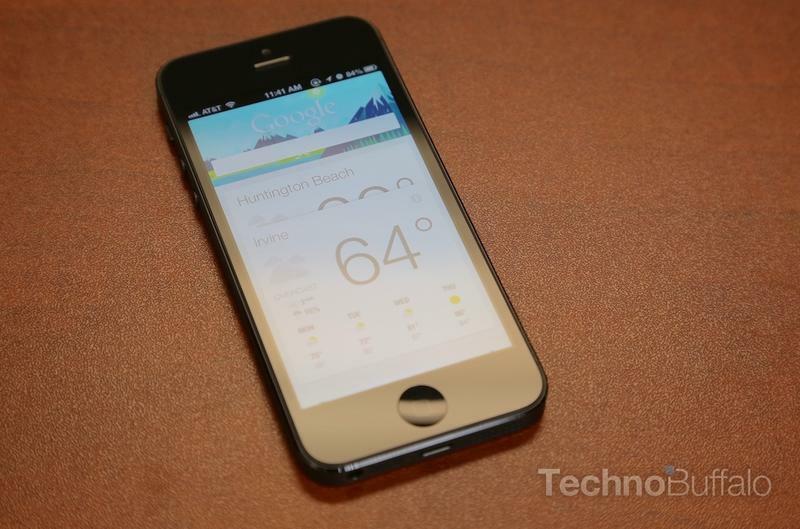 We said this is precisely what iOS needs. Unfortunately, iOS users are getting an inferior experience because of Apple's control over its mobile platform. The Cupertino company has been actively scrubbing Google out of iPhones and iPads, so that same seamless experience on Android will never be enjoyed on iOS. 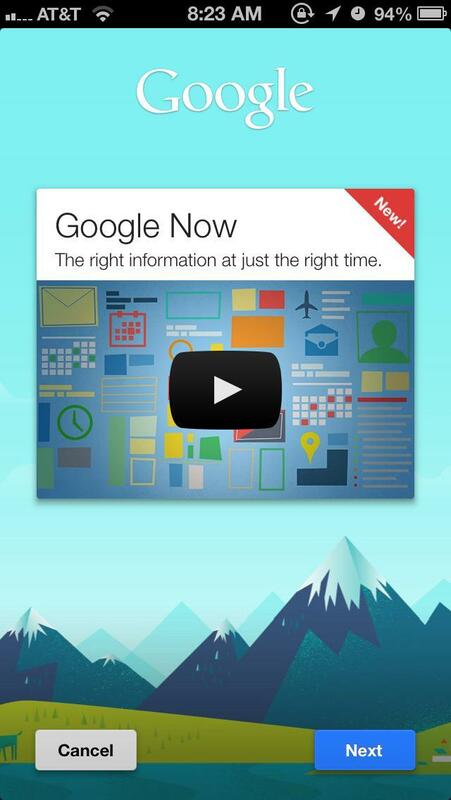 Apple should—but won't—work with Google on integrating Now into iOS. Hopefully it instead introduces a similar service this summer. At the very least, it would be great to give iOS users the option to triple click the Home button to bring Now up. We'll just have to wait for a jailbreak to see Now on iOS live up to its full potential. As it stands, the experience so far seems solid, but it's not up to the same standards you'll find on Android. We'll keep a close eye on how it performs over the next week or so and report back with what we find.